On Monday we had a knock at the door. Our local Health Visitor had come for small boy's one year check. I had no idea, as I hadn't received a letter (I pressed upon her at the end of the check, that the Children's Centre really could do with using the great Social Media outlets available, to save time and ensure appointments and advice are well received) and had literally just put him down for an afternoon nap, before the preschool run. However, I was really pleased that I had an opportunity to discuss any concerns I have with small boy and even better, in the comfort of my own home! Half of me thought perhaps they surprise you on purpose, to see how you live normally! I of course quickly scooted round as she opened all her paperwork, tidying away the mountains of toys that I'd left strewn all over the floor and sorting the dirty lunch dishes that were sat by the sink. Poor small boy, he had just stopped doing his little ritual of moaning into his soft puppy and was drifting off when I blasted in, to strip him naked to weigh him and measure his length! He was so good and when the naked part was over, he happily went back in his sleeping bag and went to sleep for an hour! Ten out of ten for me but that wasn't one of the items on her checklist! She weighed him and measured his length, 75th percentile for weight and 98th for height! Not surprising given both of us are tall beings! We then talked about weaning, milk, use of bottles which led onto dental care and I was given a free children's toothpaste and toothbrush, a bookstart pack and went through general safety in the home and in the sun. I remembered all these things from big boy's check but it was great to have a refresher. The one point that has totally passed me by, was the Government advice about vitamin drops. 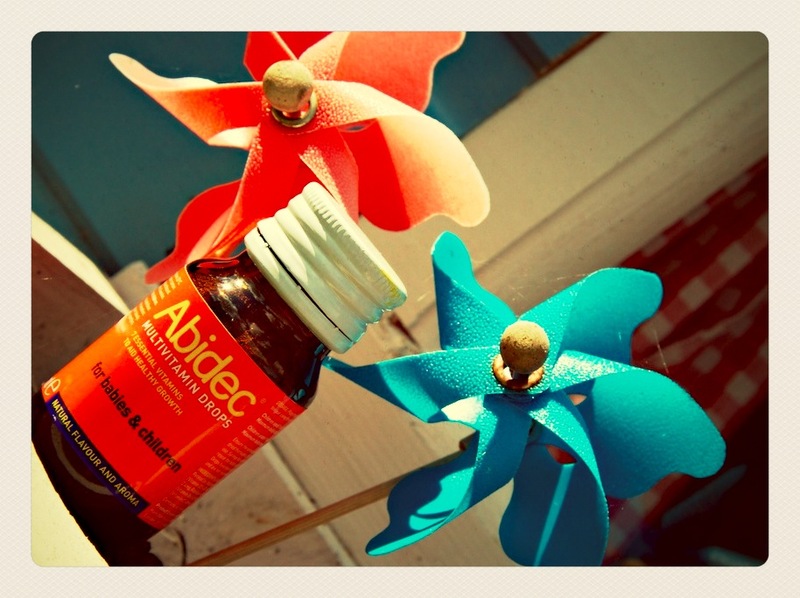 Did you know it is the recommendation that all children up to the age of five take daily vitamin supplements? I know we have had a miserable summer, but hadn't really thought of the lack of vitamin D all the children are experiencing. Depending on your circumstances you may be entitled to the vitamin drops for free under the Healthy Start campaign. Off I went to the Asda pharmacy yesterday and picked up our box. We will try and do it just before teeth cleaning at bed time to ensure we don't forget. Big boy's reaction to a syringe of orange liquid "Look at my muscles! I'm going to be big and strong!" Do your children take vitamin drops? Am I the only one who has started at age 3? !